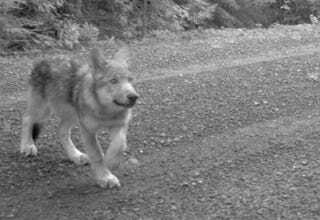 Remember the "wandering wolf," OR-7, who traveled from Oregon to California and back while wearing a GPS collar? The US Fish and Wildlife Service discovered that he's now a proud dad to at least three pups, thanks to some camera trap photos. Above: One of OR-7's cubs. The pups are also historic; OR-7 and his mate are the first wolves known to have bred and produced offspring in Oregon's Cascade Mountains (which stretch from British Columbia to Northern California) since the 1940s! They're a small, adorable conservation success story.